Last year the world’s most important white rapper Eminem came back with his successful album Relapse. The record was tough, sullen and filled with deep introspection. Back then Slim Shady and Dr. Dre worked so fruitfully that all the written tracks simply were too many for one album, and the rapper promised to release Relapse 2 at the end of last year. However, the time passed, and the number of new compositions kept growing. In the end, Eminem concluded that the new album would be notably different from Relapse in its content and thus decided to change the title into Recovery. The new disc has seen the light of the day only this June, after several delays of the release date. The two albums are different, indeed: there is less severe introspection on Recovery and more Eminem’s honest stories about himself. Besides, neither Dr. Dre nor 50 Cent are not included in the guest performers’ list but there are a couple of unexpected collaborations on the album. As for Slim Shady, he finds himself in a great form – the lyrics are even franker, and his rapping and vocals are at a high level again. No doubt the role of producers is of paramount importance on any hip-hop album, and due to such masters as Just Blaze, DJ Khalil and Denaun Porter Recovery can boast a variety of beats and arrangements. Naturally, Eminem is the protagonist of all the stories on the record, the first of which is the memorable Cold Wind Blows with a dark melody performed by Eminem’s vocals. A young singer Kobe joins the rapper on track Talkin' 2 Myself built around a guitar sample and telling of loneliness when the only person you can talk to is yourself. A bit lazy chorus on On Fire contrasts with en emotional verse, and on Won't Back Down performed by Slim Shady and Pink the rapper states that nothing can make him give up and lose his heart. A great bit refines the danceable composition W.T.P., a traditional favor to entertainment one can find on each Eminem’s album whereas another sincere story Going Through Changes will leave nobody indifferent due to its emotional chorus and a thoughtful melody. Composition 25 To Life is especially interesting among those of the kind; the famous artist’s hard life is presented on it. One should also pay attention to the emotional and rather melodious song Love The Way You Lie So Bad, performed almost entirely by Rihanna, and the album’s finale Untitled Track containing a hidden track My Friend Till The End devoted to Proof and built around one of the best beats on the record. 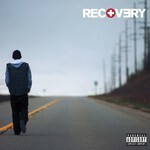 The album Recovery will not rock your imagination and become a sensation like Eminem’s debut record. It is hardly possible to say that it is difficult for him to preserve his reputation of a scandalous and frank artist, but it is a long time that he fails to surprise. Therefore Slim Shady’s seventh album is quite a solid continuation of his career, with beats of a good quality, with an essential percentage of unprintable vocabulary and unkind jokes about pop culture people. On the whole there are a lot of stories on the album about the way the rapper felt after the loss of Proof – most probably none of his following albums are going to be without mentioning this tragic event, and this must be right, otherwise all Eminem’s words about the bitterness that loss caused would be simply fiction. The seventh studio album of an artist whose life has been far from all joy still means his decisiveness to go forward in spite of everything and this costs a lot. Now he is cool looking straight into his past’s face and just tells us about his life with all of its rises and falls.